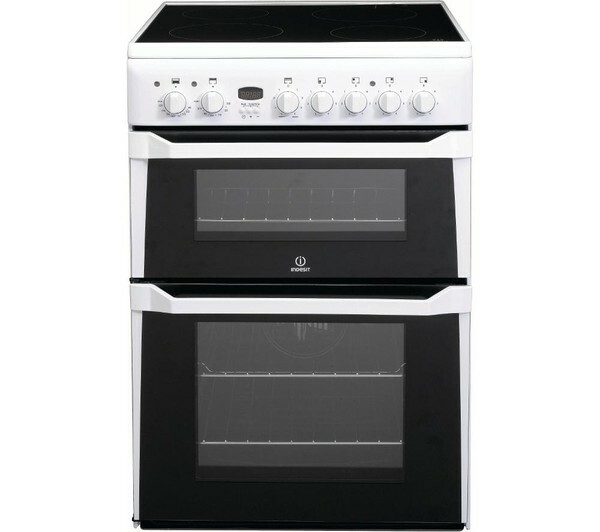 The Indesit ID60C2WS Electric Cooker, in white, has a main fan oven for even cooking throughout whether on the top or bottom shelf. The conventional top oven gives you added space to cook more dishes and it also includes an integrated grill that can be used to grill meats or finish off dishes. A minute minder with LED display lets you keep an eye on how long the cooking time has been, while an easy clean enamel interior make any grease or spills easy to clean off, saving you a load of hassle. The ceramic hob on top has 4 zones with responsive heat which you can adjust using the front dials, it is also easily wiped clean. Double glazed doors keep the outside cool and the inside hot, and an interior light lets you look inside.